Are You Using the Right Type of Needle for Your Sewing Projects? A kind of needle you have defines the quality of the fabric sewn, so choosing the correct one is as important as choosing a good material, or the thread and the stabilizer. Choosing the right one for a specific sewing project is, however, a daunting task to some people but it doesn’t need to be; it’s just a matter of matching a particular type of sewing needles with a specific kind of fabric. The forthcoming information addresses the different types of sewing needles and how you can be able to pick the right one for your particular sewing project. This type is sharply pointed with a narrow shaft, therefore, causes very minimal puckering, well penetrating the relevant fabric thread and cause no damages to the material. Since it gives an even stitch it’s a sharp pointed needle is better used on woven fabric like cotton, chintz, silk, faux suede, wool, and linen. Using it on any knit garment will lead to uneven stitches. It’s also great needle for heirloom sewing and typically any other topstitching. Regular needles come in different sizes, ranging from 9 to size 18, and the size to use will be determined by the structure and the weight of the fabric sewn. This is a perfect choice for knits fabric because it’s not sharp pointed. It’s curved therefore won’t break the knit stitches, and instead piecing through the yarn it glides between them. This is one of the reason it will work well on heavy knits, elastic and stretch fabrics. Their sizes range from 9 to 16, with size 16 having the most rounded point. 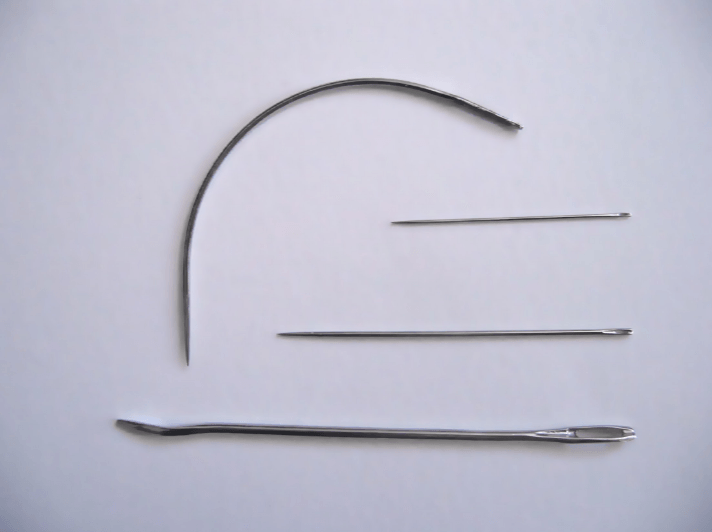 This types of the needle have a large eye to accommodate thicker embroidery threads. The scarf of the needle is designed in a way that protects the relevant thread from fraying or even breaking during the high machine speeds. They are good for selling with rayon, acrylic, and other specialty threads. Universal sewing needles usually come with the sewing machine. They are a little sharp like ball point ones, and a little rounded for knits but one can find them very useful on woven especially cotton. The universal needle most popular size is 14/90 and 11/75. The quilting needle has a tampered point, adamant than other types, therefore, allowing you to stitch on several layers of fabric and across intersection seams. The tampering point also prevents the needle from damaging the quality of the material. It’s a little small in size, and a small eye which makes it a perfect needle for piecing. In addition to these five widely used types of needles, we have other specialty needles that you might need to consider. These include topstitching, wedge-shaped needles, beading needles, leather needles, carpet sharps, tapestry and much more. Some of these needles can fall under the five mentions common types. The most important thing you may need to keep in mind is that frequently changing the needle and using the right one for your particular sewing project will make all the difference. So other than picking the right one, you need to ensure you have quality one and of different types and as a rule of thumb, if you have a big sewing task, change your needle every 8 hours.